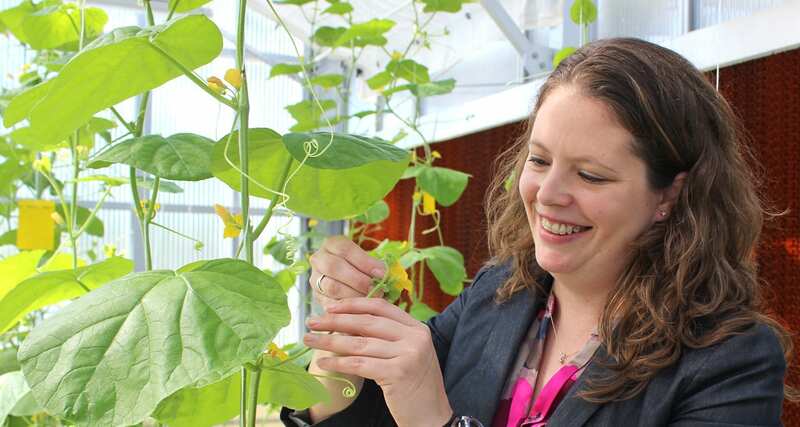 For four years, Jason Cavatorta of EarthWork Seeds has partnered with Associate Professor of Biology Liza Conrad and her students to bring a new variety of cantaloupe to market that could topple the 30-year reign of the currently popular “Athena” melon. 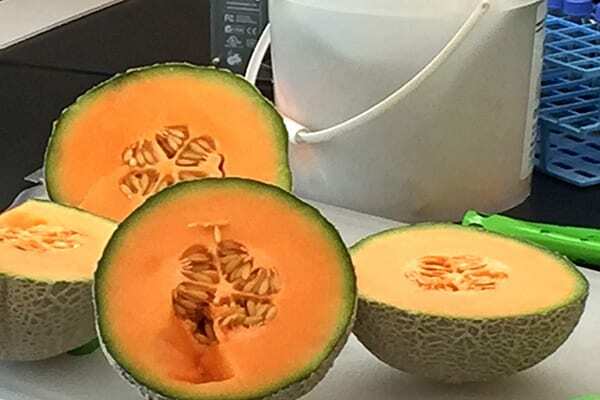 While Cavatorta, of Oviedo, took on the monumental task of selective breeding to perfect the taste of “Triton,” Conrad’s students helped identify melons with genes resistant to the common cantaloupe-killer Fusarium wilt—a soil-borne pathogen that can’t be easily treated with pesticides. The fusarium wilt resistance of the new melon should make it attractive to growers, but that isn’t the only factor that determines which fruit varieties make it from greenhouse to table, Cavatorta admitted. Mishi Vachev ’19, an Eckerd biology student from Fremont, Calif., explained to a room full of Eckerd community members at the 12th Annual Student Research Symposium on April 3 that the new melon is a hybrid with an Eastern Shipper variety parent and a Tuscan-style variety parent that gives the melon better flavor and smaller center cavity than the most popular melons on the market. Taste tests will continue, including one funded by a $500 Intergenerational Learning Grant from the Academy of Senior Professionals at Eckerd College (ASPEC). Triton will be one of 19 funded projects presenting fair-style to the members of ASPEC at 5 p.m. on April 25. Cavatorta said positive taste reviews could help him sell Triton seeds to growers around the world. With about 100 days needed from seed to harvest, he isn’t expecting Triton melons to end up in grocery stores anytime soon. “If all goes well, seeds will be available in January 2020,” Cavatorta said. 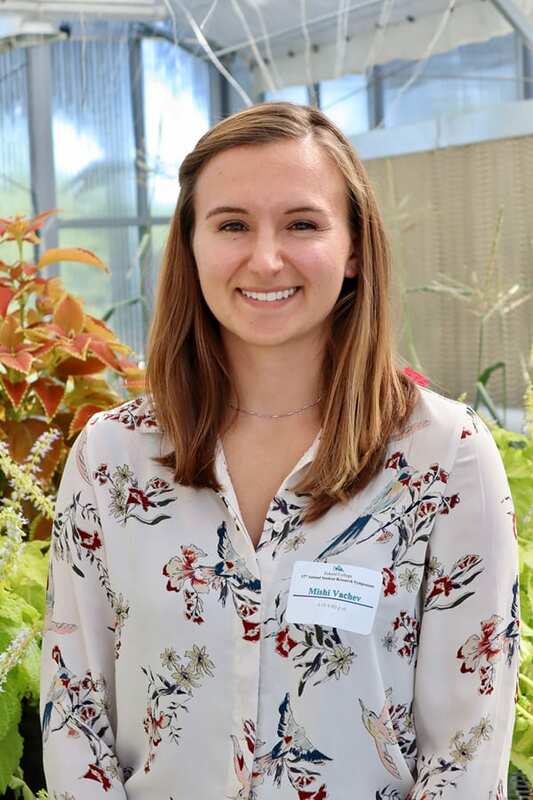 Even after that, Eckerd students will continue to refine the process of detecting fusarium wilt-resistant genes in melons to make selection more efficient, Mishi said. In her research, she worked to identify markers that indicated resistance from small melon-tissue samples. If perfected, this process would eliminate the current resistance-testing process of planting, inoculation and waiting to see if the plants show signs of chlorosis or necrosis—which takes weeks. Cavatorta said he is pleased with the outcome of working with Conrad and Eckerd students, noting that the quality of the work is similar to the output of labs not fostering students. “It’s also just a really good opportunity to introduce students to the seed industry,” he said.